Playwright, journalist, novelist, and head of the Egyptian Writers Union Mohamed Salmawy flew to the Emirates last night to give a talk at the Abu Dhabi International Book Fair about the new book Naguib Mahfouz: Man of Cinema. 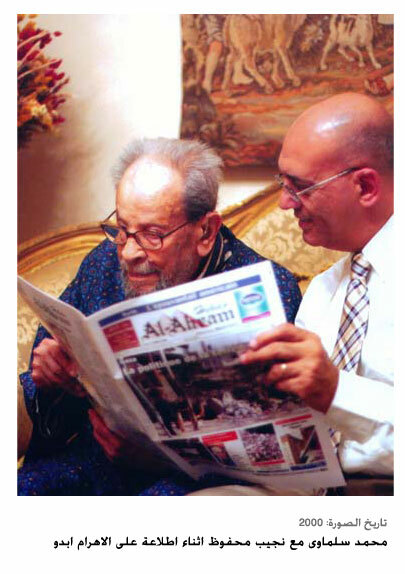 Salmawy didn’t contribute to the book, but his long acquaintance with Egypt’s only Nobel literature laureate provides him with lots of material for any questions about Mahfouz. Indeed, Salmawy immediately corrected one of my mis-perceptions about Mahfouz’s career. I had thought of the period between when Mahfouz published his giant, sprawling The Cairo Trilogy and when he began on أولاد حارتنا (Children of Gabalawi) as one void of creative work. But this isn’t true. Indeed, after Mahfouz finished his giant work, which Salmawy said “was so complicated and so vast in its canvas, that Mahfouz had to keep a notebook beside him in order to remember the characters and the description of each character,” he couldn’t write for a number of years. But this was not a fallow period.